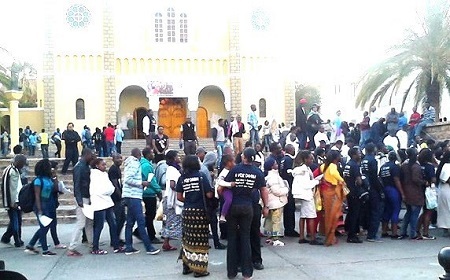 The theme of National Youth Day was “Go out and make disciples of all nations.” On Friday, August 21st, the Archdiocese of Windhoek welcomed about 617 youth from all over Namibia. This was a blessing to our youth for coming together to share the faith to each other. The national Youth Day opened officially with holy mass presided by Bishop Phillip Pollitzer, of the Keetmanshop Diocese. Due to the large number of youth, religious sisters and brothers, priests, seminarians and the faithful, the holy mass was celebrated outside the St. Mary’s Cathedral. The mass led by the youth was well-prepared. In his homily Bishop Pollitzer said, “Many of our people today refer the word Disciple to the Priests, Brothers and Sisters, but as Christians we are called to discipleship, therefore, each one must take part in it and go out to proclaim the good news.” After holy mass, the youth in their excitement continued with the singing, dancing and of course chatting and greeting each other. The next day was filled with a multitude of activities. As it was well explained, the youth will gather for Catechesis at different parishes because we were many to be accommodated in just one place. For us, we joined Fr. Richard, MM at St. Mary’s Cathedral, whose lecture was based on discipleship. Father Richard began with this question to the youth, “What are you looking for as youth of the Church today? Is it for a comfortable life? To have a good family with all that you want in life? No, Jesus is calling us to give up everything and follow him”. Fr. Richard challenged us to understand who we are by asking us this question again, what is maturity? And what is religion? He said maturity is the ability to be at the service of others, to change for the better when you have realized your mistakes and the one who is able to pick up his cross and follow Jesus in all circumstances of life. Religion is to keep oneself unspoiled by the world or work. Sometimes, we neglect ourselves and others; we call ourselves Christians but the work we do and how we relate to our neighbors is far from God. Then we ask ourselves why do I kill and keep revenge? Hating others for no reason? Why shouldn’t I change my attitudes to love my neighbor where Jesus is dwelling? We also were offered the opportunity to attend confession. One of the youth expressed that we are the luckiest to bring our sins to the Lord and ask for pardon because there are many people in our country especially in hospitals who want to confess but there is no other way, therefore, they are in the darkness. This was followed by cultural dances and presentations at St. Mary’s Parish Hall, with the theme “Religion and Enculturation” facilitated by Fr. Maurus Kantana, OMI. He said, “we must love, respect and appreciate our culture because it makes us who we are. We cannot separate culture from religion; we integrate them in our daily living.” All the deaneries and parishes had an opportunity to present something on culture like drums, dancing, singing and it was very exciting. After the cultural presentations, we began the Way of the Cross from St. Mary’s Cathedral to St. Paul’s College, Klein Windhoek. The city police helped guide us in crossing roads and streets. Though the journey was long, everybody managed to reach tSt. Paul’s College. The exposition of the Blessed Sacrament was held at St. Paul’s College sports field. The Seminarians and religious Brothers and Sisters led the intercessory prayers and songs during the Adoration. At this time, it was already dark, the chilly weather and the wind started beating up, but this awakened our hearts to feel the presence of Jesus in the Blessed Sacrament. Sunday was the closing of the National Youth Day. The closing mass was held at the same sports field of St. Paul’s College and presided by the Archbishop Liborius Ndumbukuti Nashenda, OMI. In his homily he said, “Proclaiming the Good News does not only mean going out of your village, town and city or out of parish, but to start where you are. Start with your family, friends and peers and in your parishes.” He encourages the youth to be disciples and to learn from Jesus himself taking him to all. Before the final blessing, the Archbishop commissioned the youth to go and make disciples of all the nations. Greetings, lunch and departure followed the closing mass. The National Youth Day was indeed organized and prepared.